Phoenix VCM is the only single source application that provides Media Asset Management (MAM), Archive Management, and Multi-Tiered Storage Management. User friendly interfaces allow you to search, preview, re- purpose, and share content with other systems. Log video and create unlimited user defined metadata fields for quick and relevant searching of all managed video assets. Share metadata to and from other systems including Avid, FCP, Premiere, and others. 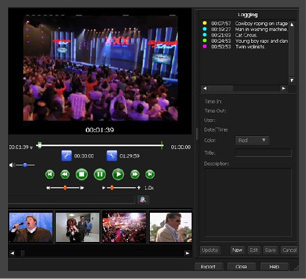 Integrates easily with third party products including transcoders, LTO libraries, and Play-to-Air servers. Extended video data storage support including SAN, NAS, LTO, and RDX. Free up space on expensive storage. Archive projects, bins, and sequences. Create automated policies to backup or move content from Unity, ISIS, XSAN, and other expensive tiers of storage. Manage both online and offline archived content. Rapid search and playback of all archived assets. Easily re-purpose any archived asset. Create and preview proxies of all video content. Logging and extensive user defined metadata. Search metadata, storyboards, and proxies. Export full or partial clips to your desktop, other storage locations, or other devices (edit systems, transcoders, delivery systems, etc). earch closed captioning, scripts, rundowns. Supports all forms of digital media (video, audio, stills, etc) and documents (Script Files, Word, PDF, Excel, etc). Security: Right person sees right files. Rest assured, your assets are properly managed and protected.